You ask, ‘that can’t be legal?’ It’s probably not. ‘Surely, NASCAR’s shiny new Optical Scanning Station would have caught that?’ It would have. But, what these rule-makers are dealing with is race car transformers. Kevin Harvick’s machine looked nothing like that as it crossed through NASCAR’s new OSS inspection. In fact, it didn’t even do that on the first part of lap 1, on any run. But, as the car reached speed, the rear window would buckle. As a yellow came out, or when Kevin Harvick went to victory lane, it would flex back to normal. 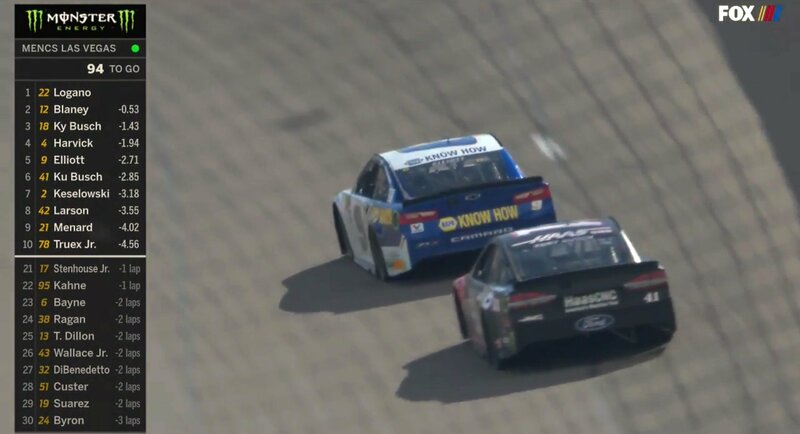 This trickery caught the eyes of Chase Elliott and Alan Gustafson during the race. The crew chief inquired his driver on his closer view of the window. There’s no doubt that the Ford’s have been dominant this year which comes as a surprise to all of us. However, this specific window buckling was only on Kevin Harvick. Even his Stewart-Haas teammate had a rear window that was perfectly straight. Is it an advantage or disadvantage? Is it on purpose or by accident? Those are my questions. I’m only guessing but I’d say it was likely on purpose and the intention was certainly an advantage. The real question is how? I’m really not the one to answer this but I have some guesses. The buckling took place at the very last bits of each straight-away at maximum aero downforce. Would pushing down the rear window allow him to go faster in a straight line toward the end of the long straights? I don’t know. Perhaps, though I would think that by trying that you would cause a side effect of more drag from air hitting the rear spoiler. That right there is what I think the intention is. I think letting more air come down the right side of the rear window would guide air specifically to the right side of the rear spoiler. More air on the right over the left might keep the car more planted on the entry. When Harvick or anyone else steps into the corner, the rear end wants to jump out. The nose weight shifts to the bottom on the cut of the wheel, the rear weight doesn’t always want to follow suit. What if you could use air to prevent that? What if the air was pushing on the right side of the spoiler specifically. Essentially, pushing the car back into shape? Could you be back in the throttle sooner? Or maybe, the rear buckling is only a side effect. Maybe what’s really an advantage is the roof being pushed down on the front end, making it a slimmer bullet through the air. Then, all the access slack of the roof is being pushed to the back, causing the buckling. Like rolling out dough on your kitchen table, it’s thin on the part that’s rolled then excess builds on the part that hasn’t been rolled yet. Kevin Harvick climbed from his car in victory lane on Sunday. While doing so, the pressure from his hand alone was enough to buckle the roof by 2 inches on the left front corner, near the front window. It would appear the entire roof is flexible and intended to be. I’m not an engineer. I’m just taking guesses. It’s highly likely we’ll hear more about it later this week. No word from NASCAR. 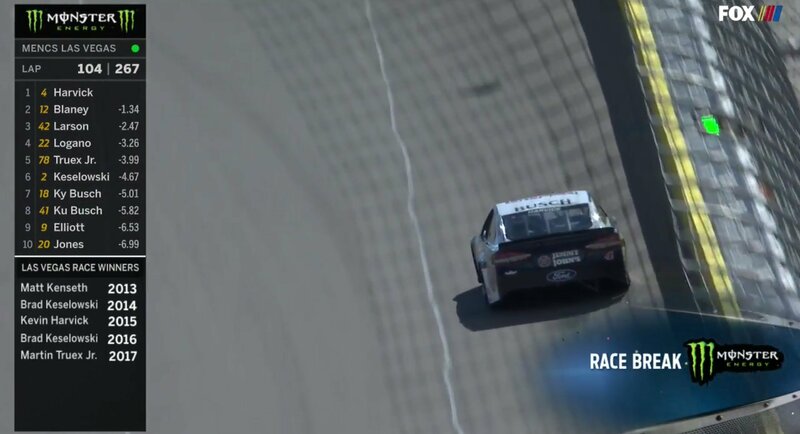 However, in 2017 Chase Elliott received an encumbered finish for a piece of tape. In that situation, the team cleverly installed a tiny piece of tape on the rear spoiler to make it taller and create a bit of a wicker effect. A wicker allows less drag down the straights while using the important parts of the spoiler in the corners. To some degree, more air to the right side of the spoiler, at certain times acts the exact same way as a wicker spoiler does. In this case, it’s just brilliantly applied. Assuming it was intentional. There’s a chance this is legal. Or at the least, a grey area. NASCAR mandates window brackets to prevent this sort of thing and promote safety over performance. However, rulebooks are designed to be edited. This come open the door to new rules. The race car will be taken back to the NASCAR R&D Center for a thorough inspection, as well other cars. Given this is pointed out, they might take a closer look at that area. We’ll all find out on Tuesday/Wednesday if it’s legal or not. Kevin Harvick has dominated the previous two NASCAR Cup Series races. 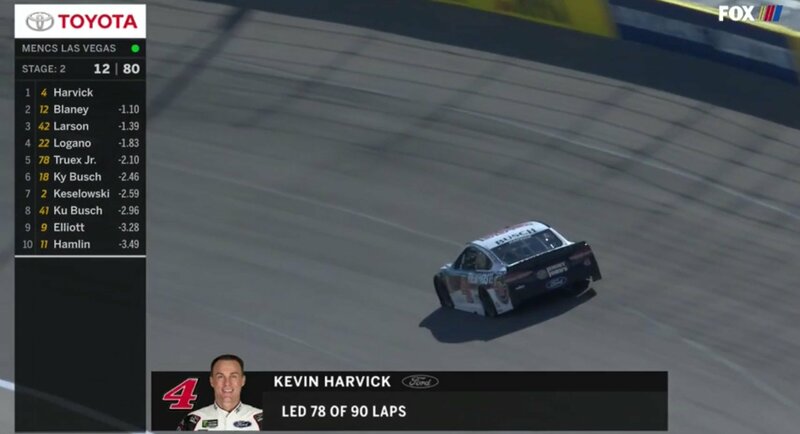 In the 3 races so far, Harvick has led 395 of the 697 in total. Yesterday, at Las Vegas Motor Speedway he led 214 of the 267.